Well, in case you were wondering, Yes, I did make the Lane cake for Mark’s birthday. I didn’t remember how complicated the recipe was, but I did accomplish the task without needing to use whole cherries and lots of icing to compensate for crooked cutting. This time I knew ahead of time how important it was to cut the layers evenly. I took my time to carefully cut each layer; going around the outside keeping the long, serrated knife in the middle of the layer, then slicing through the middle. This time I cut the layers evenly. This time my cake was level! My mistake taught me a lesson, and that lesson enabled me to be successful! When Moses grew up and saw the hard work his people were forced to do, he was grieved by the harsh treatment they received from the Egyptians. One day he saw an Egyptian beating one of his own people and a righteous anger rose up within him, and thinking no one was watching, he killed the Egyptian. However, someone had seen his mistake, and it caused Moses to be afraid, it put him danger, and he needed to flee Egypt to save his life. Our mistakes can bring shame and condemnation that cause us to believe we are disqualified from doing what we think is right. They can bring fear of ever trying to do it again. God called Jonah to take a message to the people of Nineveh. They were living very wickedly and God told Jonah to pronounce judgement against them. Jonah got up and went in the opposite direction to get away from the Lord. Jonah’s mistake resulted in him being tossed from the ship, sinking down to the bottom of the ocean, then swallowed by a huge fish. Our mistakes can bring fear, isolation, and hopelessness that cause us to believe we aren’t worthy of a second chance. Peter thought his loyalty to Jesus was strong, he said he would go to prison with Him, and even die with Him. But that very night Peter made a big mistake, he denied he even knew Jesus, not just once, but three times. As Peter looked into Jesus’ eyes he went out and wept bitterly. Our mistakes can prove that we are capable of doing the very thing we said we would never do. These examples of mistakes from the Bible are huge compared to cutting cake crookedly and winding up with an uneven cake. But any mistake no matter how big or how little can be a learning experience if we allow God to work it together for our good. It will bring the good God intends. Moses spent forty years in Midian before God called to him from the burning bush. Moses was no longer living in the Pharaoh’s palace determined to rescue his people, to fight for their deliverance. He was now a lonely shepherd, tending his father-in-law’s sheep. Mistakes are meant to humble us. Mistakes can teach us that we can’t do it on our own. Jonah spent three days in the belly of a fish. He knew he had made a mistake in running from God. He cried out to God for a second chance. Mistakes can leave us helpless. Mistakes are meant to leave us desperate. Peter wept bitterly as he looked into the eyes of Jesus and walked away. Mistakes are meant show us our own hearts. Mistakes can reveal what is really inside us. We can allow mistakes to define us. We can allow mistakes to refine us. It all depends on what voice you listen to. Moses was conflicted when God’s voice told him to go and tell Pharaoh to let His people go. Moses had allowed his mistake to deem him incapable, disqualified, and found excuses to prove his point. What would have happened to Moses and the Israelites if Moses listened to his own voice instead of God’s? Jonah was conflicted when God’s voice told him to go tell the Ninevites to repent. He didn’t want to go to those people; they weren’t deserving of God’s mercy. What would have happened to Jonah and the Ninevites if Jonah’s mistake didn’t cause him to become desperate and beg God for a second chance? What voices of shame and condemnation did Peter hear when he denied Jesus and went out weeping bitterly? What would have happened to him and to the early church if Peter allowed his mistake to convince him he no longer loved Jesus the way he thought he did, the way he used to? Some are bigger than others, but with every mistake we have the opportunity to choose what voice we will listen to. When we allow the voice of the enemy to convince us that a mistake we made has disqualified us and made us incapable we have allowed our mistake to define us. When we allow the voices of accusation and condemnation to bring insecurity and excuses to keep us from obeying the call of God, we experience the harm the enemy meant for us and for those around us. When we allow our mistakes to convince us that we aren’t worthy of another chance we have allowed our mistake to define us. When we believe the lies that we are too far, and things are too hopeless, we won’t cry out to God in desperation for a second chance. When we make the ultimate mistake, the one we once thought we would never make, we realize we can’t even trust ourselves, and we allow it to define us. When we trust our own thoughts and feelings we focus on self improvement and it results in striving, but leads to nowhere. But, Praise God, there is another voice! The voice Moses finally listened to and became the great deliverer of the Israelites! The voice the Jonah listened to and proclaimed judgement to the Ninevites that lead to their salvation! The voice Peter listened to and responded with love for Jesus that empowered him to become a powerful preacher resulting in thousands believing in Jesus, the beginning of the church that remains today! Mistakes are intended by God for our good! They are opportunities to listen to what God has to say to us, what He has to teach us, and how He wants to refine us. We are intended to learn from them and become better because of them. We are to gain understanding and renewed trust in God so that the very thing we messed up is redeemed and restored. Any shame and condemnation that was meant to harm us is intended to be turned to great joy and praise and thanksgiving to God for His love and faithfulness towards us!! 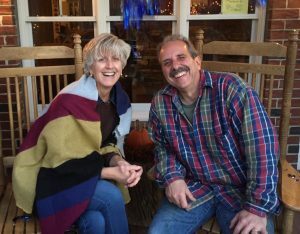 This week my best friend, my wonderful husband of 36 years, is celebrating a very special birthday. It seems as though it was just yesterday we celebrated his 23rd birthday together. We were engaged and he drove the three hours to visit me for the weekend. I had decided to make him a birthday dinner. With our wedding just several months away I had recently received a recipe book. Looking back I’m amazed at what I chose to make for my first dinner. I was then to put filling between all the layers. 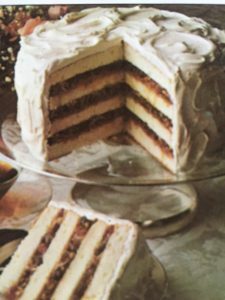 The filling was made of chopped candied cherries, pecans, shredded coconut, and raisins. I began this step and it was looking pretty good, until I placed the top layer on. The slightly crooked layers had become incredibly crooked! Whole candied cherries are a lot bigger than chopped cherries. I filled the low side with whole candied cherries! They evened out the cake! All I needed was the wonderful icing that covered up my mistake. The icing that would cover up the fact that I wasn’t really good at making a cake. The icing that would cover up the compromise I made so that it looked good. And it did look good! 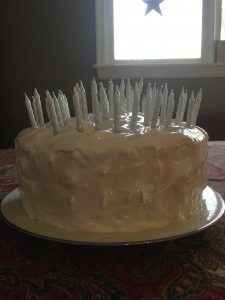 Now what I needed to do was to mark the cake somehow so that I knew which side to cut into, the side that was good, the side with the proper filling. I’m glad to be able to tell you that I did admit to Mark my mistake, my failure at cutting the layers evenly, and the way I compromised so that it looked good. I’m thankful that Mark was so gracious and laughed with me as I showed him the whole cherries that made up for my inability! But, even now as I reminisce about that birthday dinner and that Lane cake, I see how my life has been very similar. There were some lessons in that first birthday cake that have taken me years to really learn. Yes, I can even spiritualize cake making! How often have I thought, “I got this.” I don’t need to take the time to figure it all out. I don’t need help or advice from others who have experience. Similar to what I wrote last week, I chose to depend on my own understanding. What I have learned is that when I take things into my own hands and do things the way I think is right seems to be okay for awhile. Separately the layers of life look okay, maybe a little crooked, but nothing significant. But when added up together the crookedness increases. When crookedness increases in life, when the little things that haven’t been “cut correctly” are brought together it shows. It’s not what was expected. It’s not right. As much as I wish I could hit the delete button and try again, I can’t. The layers have been cut… it’s too late to try again, too late to have a re-do. Even though I realize that if I had only taken the time to make a plan to cut them straight I wouldn’t have this problem, all I can do is move on and find a way to even out my mistake. But, how do I move on? How can I solve this crookedness? How can I make right what I messed up? What do I do when my life looks crooked? I didn’t like the uneven cake, it showed I made a mistake. I didn’t want Mark to see my mistake. I chose to find a way to make up for my mistake, and to hide the wrong side. I realize that I have used many whole cherries and a lot of icing in my life. I have done things and responded in ways that weren’t right, and I have made choices that weren’t good. At the time they seemed to be the answers to make my life look even, things that would hide my mistakes. I wanted my life to look great. I was concerned of the way I appeared from the outside, because that seemed to be what really mattered. But what if I had just accepted my cake the way it was? What if I accepted and openly admitted my mistake without compromising? Without trying to appear perfect? Mark and I didn’t just sit there that night and look at that beautiful cake. We didn’t just admire it and appreciate my efforts. No, to fully enjoy it we needed to cut it. 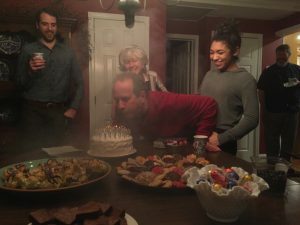 And once the cake was cut open and we were enjoying the “good side,” I felt safe to admit my mistake and confess my compromise. 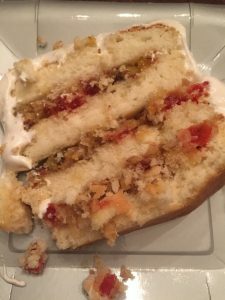 I realized even though I couldn’t cut cake straight, even though I put whole cherries in the cake, and covered it all with icing, Mark loved me for me, not for what I could or couldn’t do! Like this cake, to enjoy life I need to be cut open. I need to face my fear of exposure. In this place of vulnerability I have found the exact opposite of all I thought. Instead of judgement and condemnation, I received amazing grace and unconditional love from both my heavenly Father, and from my earthly husband! They have both taught me that it’s okay to make mistakes. I don’t need to be perfect, or compromise and cover up so others think I am. Much life has happened in the 37 years since I baked that cake. 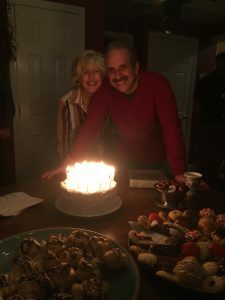 Now as Mark is celebrating his 60th birthday I am so thankful for sharing and enjoying the cake of life together, the mistakes, the whole cherries, the icing, and all! It has been a wonderful life! Happy Birthday, Mark! Wishing you many more birthday cakes of life spent with you. You are a faithful man of God, an amazingly gracious and incredibly loving husband, an encouraging father, and soon to be a fun-loving Pop-Pop!! While I was considering what a life that fully trusted God would look like I thought of George Mueller. If you have never read of the life of George Mueller, or if it has been a long time since you have, I recommend his story to encourage you in your faith and trust in God. 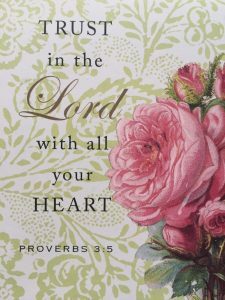 that tells about him and includes some quotes that have encouraged me as I consider what it means to trust in the Lord with ALL my heart. I’m fascinated how the grace that caused George to trust God alone created within him a grief for those who didn’t have that same grace. 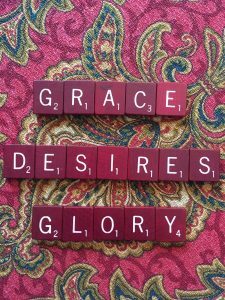 Instead of just living in that grace and wondering why others didn’t trust as he did, or judging others for their doubt and unbelief, he had a desire to live a lifestyle that demonstrated that God is indeed trustworthy. He was motivated to open orphanages and care for thousands of children. This ministry was an opportunity to display to others the faithfulness of God as he trusted in Him alone for every need and every penny required to care for the thousands of children that came to his orphanages. The most important thing…fellowship with God Himself! George learned that a life that trusts God completely comes from a joyful soul. This reminds me of my 2017 verse… “Beloved, I pray that you may prosper in all things and be in health, just as your soul prospers.” 3 John 1:2 When we choose to put all else aside so that we are alone with God there comes upon us a love, peace, and a joy that nothing else can ever produce. Every day we are faced with the good, better, and best. Which will we choose? Will we choose what our flesh wants. Will we choose what makes sense to us? 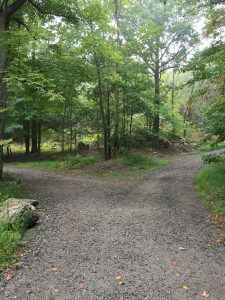 Or will we choose to look beyond the desires of the flesh, push past our own understanding, and choose instead to look to God and trust in what He says is best? Self-denial will only be accomplished in the absence of fear. Perfect love is what overcomes fear. When we deny ourselves and choose God’s best we find His perfect love makes us brave and courageous to do things we could never have done on our own. We are willing to take risks that will show the faithfulness, the goodness, and the beauty of God! Knowing God is the key! God wants us to know Him, that is why He created us and why He has preserved His word for thousands of years! The God who spoke and everything that exists came into being. The words that spoke life into nothingness still speak life into every soul that studies, meditates, and applies them. When we learn of God’s character, how good, gracious, loving, and powerful He is, and we study the living and active words of God our thoughts, attitudes, perspectives… everything about us is changed from the inside out. Our bodies, souls, and Spirits become aligned to His truth! The word of God…food for the inner man! Jesus told the tempter in the wilderness, “It is written, ‘Man shall not live by bread alone, but by every word that proceeds from the mouth of God.’”Matthew 4:4 God’s word is as food for us. Just as we need daily food to sustain our physical bodies, we need the food of God’s word to sustain our spiritual bodies! We may get away with these excuses for a few days, but you can be sure you would soon find the time to eat, and you would soon realize the benefit from food. So why do we think we can get away with using these excuses for our spiritual eating? So often we aren’t tuned into the subtle affects of not eating the words of God. But, though they are subtle, there are consequences that not only affect our spiritual life, but also our physical life. Choose a lifestyle that puts the beauty of God on display! Satisfaction in God is the only thing that sets us free. No self-help book, counselor, or positive thinking can bring true freedom from the things that hold us back from living the destiny we were created for. The freedom God brings strips away all fear, all insecurities, all fleshly desires and replaces them with His love. Filled with His love we become brave and courageous to step out into the ministry, the work, and the purposes that truly fulfill and satisfy us and bring glory to God! God invites us to trust in Him with ALL our heart! I’m thankful for these notes and quotes from the life of George Mueller. They remind me of the simplicity of trust. The intention to make time alone with God first priority in my life. The intention to choose what is best over what is good, and even what is better. To intentionally get to know God through reading, meditating, and applying His word in my life. To intentionally feed on God’s word everyday, recognizing the significance it has in my body, soul, and spirit. All because I know that the Living God, my Father in Heaven, cares for me! This year my New Year verses came to me very loud and clear. 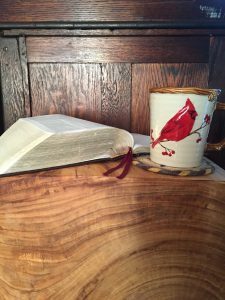 They are familiar verses, but God has impressed upon me that it is possible to become so familiar with verses that I think I believe them, that I am living by them, when really, I have much more to learn. This is what is so amazing about God’s word…verses that I have known for years all of a sudden take on a deeper meaning. Words I have memorized I suddenly read differently. God’s love for me is relentless! Because then, God will show me what path to take! God loves us too much to leave us knowing what He says, but not doing what He says. Knowing what God’s word says is only the beginning. Doing God’s word, is living the way we were created to live. When we trust in anything or anyone other than God we won’t give the glory to God. Our story about that situation and the result of how that problem was solved will include whatever or whoever we trusted in to help us. We will give credit to ourselves or to others instead of God. But, because I am God’s child He wants my stories to give Him glory! When we depend on our own understanding and figure out how to solve our problems according to our knowledge, or look to google or an expert for the answers we limit ourselves to man’s understanding, man’s experiences, and miss out on an opportunity to realize the incredible power and love of God. God’s ways are so much higher than ours and His thoughts are so beyond ours and by depending on our own understanding we won’t experience the specific answers God has designed uniquely for us. We will miss the very things meant to increase our trust! When we don’t seek God for the ways we should go we are bound to make some wrong choices. We will reap the consequences of choosing our own way based on our feelings and on what makes sense to us. God has planned a destiny for each one of us before the beginning of time, meant to impact those around us and many generations beyond us, but we won’t discover it if we don’t seek His ways. In this ever-changing world knowing how to respond or what decisions to make is so needed. But that is what makes this promise so amazing! This is a promise from God who never changes, but is the same yesterday, today, and forever! It is a promise that I want to receive, and so I need to do my part. I know what these verses say; I have them memorized since I was a child. But, do I completely obey them? Yes, there are times when I respond with full trust in God and allow Him to work out the situation in His time, and in His ways, and I have seen amazing answers to my prayers. But, there were other times when I reacted out of my flesh and got angry or tried to bring control into situations that only made things worse. I had my reasons and it was easy to blame others, but what was I afraid of that caused me to react the way I did? Why is my heart divided? We all have our specific areas that we find difficult to trust God with. The one I am going through now involves my hopes and expectations I have as a mother. I was asked the other day, “What are you afraid of?” My disappointment, anger, and control were clear evidences that I had fear. As I read them over I thought they were very legitimate fears of any good mother. After all, I am called to train up my children in the way they should go. I began to add my fears to the list of things that can’t separate us from the love of God. As I did God gently spoke to me and said that to trust Him with ALL my heart is to believe that He loves my child more than I do, that nothing I fear is stronger than His love, and if I place her into His loving hands, He can do in a moment what I could never do, no matter how much I try. So, I knew I needed to confess my sin of reacting in fear, trusting in myself, and for the hurt it caused others. I asked Him to forgive me for believing I could figure out what to do and for thinking I knew what was best. Next, I looked up the word trust – firm belief in the reliability, truth, or strength of someone or something. In order for me to trust in the Lord with ALL my heart I need to be fully convinced that He is who He says He is, that His word is truth, and that there is nothing He cannot do! Then God began to show me once again the importance of reading His word…so, this year, 2018, I purpose to choose reading God’s word over other things that seek my attention. I’ve been reminded of the power of my thoughts, and pray that God’s word will give me true thoughts of who He is and give me an undivided heart to trust Him completely, no matter what! So, once God highlighted these verses I knew they were to be my 2018 verses. I believe this year He is going to teach me more about trust and I pray I will have many stories that will tell of His great glory! Mark brought me his read-through-the-year Bible and wanted me to read the Proverb verses for the day. His Mom had always written Proverbs 3:5-6 in his birthday cards, but verses 1-4 caught his attention this morning. They are so fitting with what God has been showing me about the importance of reading His word! Thank You, God, for Your perfect timing!! Mark and Brian had a trade show up in Toronto, Canada and Kayla (who was four at the time) and I went along for a little vacation of shopping and swimming in the indoor pool. Toronto is also the home of the Airport Church that is known for a great spiritual revival, so when my friend heard I was going to Toronto she said I should visit that church Sunday morning. I appreciated her suggestion, but didn’t think I really would. Mark and Brian had several days at the trade show while Kayla and I spent the mornings in the pool and the afternoons looking for “Canadian” Christmas presents. We stayed at a hotel right in the city, so they could walk to the Convention Center, and we could walk to the stores. I didn’t forget my friend’s suggestion and when Sunday morning came I was curious to know if it was at all possible to go. Mark looked up the address and looked for the options to get there. He wrote down the address and what seemed to me some really confusing directions on a very small piece of paper. “Wow, I can’t figure all that out, there is no way I’m going.” I took the paper and put it in my pocket and the four of us went to breakfast. While eating I noticed some sparrows outside the window busily finding seeds when I “heard” the Lord say, “See those sparrows, just as I watch over them, I watch over you.” I knew in my spirit that I was to go to the church no matter how confusing it seemed or how afraid I was. So after breakfast Mark and Brian went to the trade show and Kayla and I began a journey I never imagined I would have the courage to make. Though I’d lived in New Jersey for many years, I was still a country girl with no city experience whatsoever! So with those sparrows on my mind, pushing past my fear, and expecting to receive something amazing from God at the church, I bundled us up, put Kayla in her stroller, and walked out the hotel door in search of the subway. I found the entrance to the subway and descended the several flights of steps. When I went to pay for our tickets I mentioned where we were going and the clerk told me I was on the wrong side, I needed to go up those flights of stairs and go down the other side. Okay, better to find out now rather than later! I folded up the stroller once again and carried it and Kayla up the stairs, and down the right side. The train traveled awhile underground and then came up outside and after awhile stopped in what seemed the middle of nowhere. There was a bus stop there and I figured I was to take a bus the rest of the way. But what bus? I went to the driver of the only bus there at the time and asked if that bus went to the address of the church. He said it did so I asked him to let me know when we got to that stop and he said he would. But once I sat down in the back of the bus I looked up and that driver walked off the bus and another driver got on. “O Lord, now how will I know where to get off?” Once we were on the road for awhile I had the courage to start some conversation with those around me and I asked if anyone knew where I needed to get off. (Yes, this was before I was set free from my fears of what people thought of me.) They were very helpful and finally we arrived at the stop. Several of us got off and some of them where also going to the church. I followed them because I still didn’t know where the church was. Once we were finally there I expected something incredible. “God, thank You for getting us here, after all I just went through You must have something really important You want me to hear. So here I am, Lord, speak to me.” We were obviously late so we stood in the back which was good because Kayla was ready to stretch her little legs. I really can’t remember much of the service other than that they had a baby dedication that day and there must have been at least 30 babies. One thing that I did notice, there was a woman about five rows in front of me wearing a plaid skirt and I don’t know why, but for some reason I kept looking at her, and her plaid skirt. Then the service was over. It wasn’t anything like I expected. “Lord, don’t You have something for me? I pushed through all my fear just for that?” I put our coats on, Kayla got back in her stroller and we followed the crowd out the door, feeling very let down. Then I realized I needed to reverse everything I did to get there. I hadn’t really thought about that, but I did figure out I needed to get to the bus stop on the other side of the road which was outside the industrial park. Just as I began to walk in that direction a car pulled up beside me. The woman rolled down her window and asked if she could give me a ride. I told her I was going to the bus stop, but that would be a great help. When she got out of her car to help with Kayla and the stroller guess what she was wearing… yup, the plaid skirt I kept looking at all morning! When I was buckling Kayla in the back seat beside her daughter, she asked where we were going and I told her the name of the hotel we were staying at in the city. That’s when she offered to take us there since they “lived right nearby.” “Oh God, this is amazing! I don’t need to reverse it all!” I honestly wish I had recorded our conversation as we drove to the hotel. She talked mostly of what she and her husband did and even as she was talking I couldn’t understand it all. All I remembered was that it had something to do with worship. It was Thanksgiving Day weekend so there was a big parade going on that afternoon which caused her to have to go way around the city to get to our hotel. I felt bad that she needed to drive so far, so when I saw some familiar stores we shopped at the day before I told her to just leave us off there, but she insisted on dropping us off at the hotel. After thanking her over and over again and saying good-by I walked into our hotel completely overwhelmed. I couldn’t believe what had just happened. I may not have received anything during the service, but that miraculous ride back to the hotel was a gift from God I will never forget! 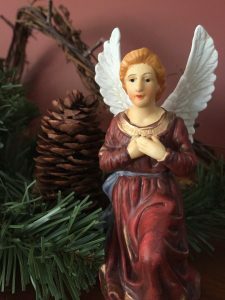 The following year Kayla and I heard a story on the radio of a preacher who had a similar experience, and a miraculous climax that made it clear he was rescued by an angel. We heard that story played several more times and each time we heard it we were reminded of our experience in Toronto. I believe that woman was an angel sent by God to help me in my time of need. I believe my experience in going to the Airport Church, and God’s gift of sending an angel to bring me back was the very “thing” God used to teach me the importance of pushing through my fear, to fully believe that He cares for me and watches over me, and to listen to and act on the promptings of the Holy Spirit, no matter what. It was an experience that I have never forgotten, it never loses it’s wonder, and it has given me courage to do many things and to go many places since then.